SuperSport, Goal.com (Marrakech, Morocco, June 16, 2013) — Morocco defeated visiting Gambia 2-0 on Saturday in a 2014 World Cup qualifying match at the Marrakech Stadium to move to second place in Group C behind leader Ivory Coast, ahead of Sunday’s pivotal clash between the Elephants and Tanzania. The Atlas Lions opened the scoring against Gambia early in the 4th minute, with midfielder Abdelaziz Barrada striking off a fine assist from Youssef El Arabi. Younes Belhanda claimed the hosts’ double in the 51st minute to bring to an end the Gambians’ run in the qualifying. Morocco kept alive their very slender 2014 World Cup hopes, moving from third to second place in Group C with eight points, prior to leader Ivory Coast’s visit Sunday to Tanzania, whom the Atlas Lions have replaced in the No 2 spot. 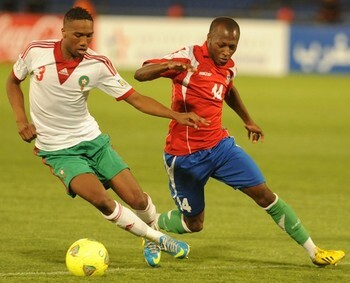 Morocco’s Zakarya Bergdich, Sanna Nyassi of Gambia fight for ball during WC2014 qualifiers match in Marrakech. Gambia’s teenage goalkeeper Boubacarr Sanyang was tested almost immediately out of the blocks by Morocco to deny Hamed Allah a first minute chance. Three minutes later, Sanyang wasn’t so lucky as the Atlas Lions went ahead through Getafe midfielder Barrada. Morocco goalkeeper Mohamed Amsif was also tested, three times in a three-minute spell, by Gambia’s attackers that included a double shut out from the Atlas Lions stopper in the 19th minute. Barrada then wasted a chance to complete a brace in the 34th minute before Morocco went into the break with a 1-0 lead. It took just six minutes after the restart for Morocco to extend their lead. This time Belhanda found the target against bottom placed Gambia who have just one point in Group C. The highly rated Montpellier playmaker almost added his second of the day on 71 minutes but amazingly saw his shot come off the woodwork. 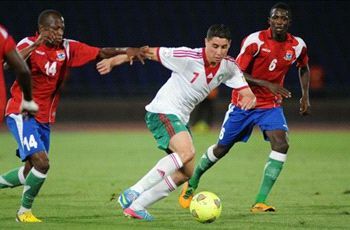 Morocco’s Barrada drives with the ball against Gambia. Two minutes later, striker Chakhir Belgazouani was unlucky not to score when his goal-bound effort was blocked just three minutes after replacing Hamed Allah. Morocco’s victory moves them just two points behind Ivory Coast whom they visit in both sides’ final Group C qualifying tie in September. However, a win or draw against Tanzania for The Elephants, who have six points, will render Saturday night’s result moot and see Ivory Coast seal their final round qualifying berth with a game to spare.